Are you sick of winter yet? Even if you love cold and snow, you may be sick of seeing people track up your hardwood floors with their boots and then throw their wet coats on the chair. When you look at your home, you may realize that even in better weather, shoes, coats, and other outdoor paraphernalia gets the best of you. Your answer may be in setting up a mudroom. 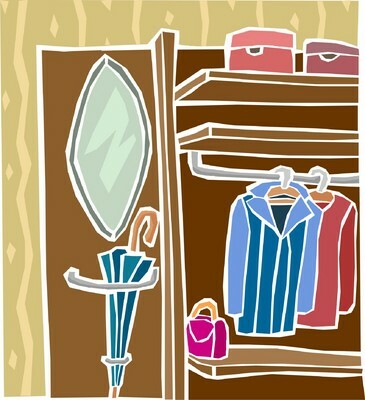 The mudroom is a designated area for outdoor wear, including not just jackets, coats, boots, and shoes, but also hats, gloves, scarves, and even sports equipment and backpacks. Ideally located in the side or rear entrance, the mudroom can be a transition into your home and a way to keep dirt and clutter out of your living space. When you look at the layout of your home, there may be an area you can transform into a mudroom without much work. It might even be a matter of adding some hooks to the wall, with shoe racks down below. The trend these days is to have it separate form the laundryroom. Even if you need to do some major or minor reorganizing to create a functional mudroom, it might be worth it. Not only will it make your house more functional, but it will be a good selling point to a future owner. A mudroom might not be in the top of the list for potential buyers, but is definitely one of those things that they're happy to get. January is traditionally a slow month for real estate. Although I've been fairly busy, I know that when spring comes, life will become even crazier, as buyers want to buy a house that they can close by June, so they can spend the summer in their new home before school starts in the fall for the kids. Meanwhile, sellers want to list, in hopes of finding a perfect match with a potential buyer. If you're getting ready to sell your Louisville home, you may need to put some money into it to make it more attractive to buyer. What exactly are buyers looking for, especially those looking for "move up" houses? When they buy the second or third time around, people may have different expectations than first-time buyers. In any case, they most likely have more money to work with so their expectations of amenities may be more reasonable. Embellished showers: With glass frameless enclosures, glass tile walls, and curbless design, separate showers rock! Standalone bathtubs: Louisville has loved clawfoot tubs for ages, but other standalone designs are popular as well. Is buying a new home on your list of resolutions for 2014? You might not want to face Louisville's bitter cold and snow right now, but it's a good time to think carefully about what is on your list of "must haves." Based on what we've picked up from watching The Property Brothers, Love It Or List It, and other TV home shows here are a few things to keep in mind. Keep in mind that Louisville offers good housing values, but as the real estate market recovers, prices are increasing a bit. You want to get a deal, but the seller wants a fair price for their home too. Just as we counsel sellers to be realistic about their asking prices, as buyers, you need to offer a fair price as well. Your perfect home may be out of your price range, but is often attainable if you're willing to do some renovations. By obtaining a 203 mortgage rehab loan, you can have much of the work done before you move in. The total amount for the property and the renovations cannot exceed what your lender will offer you. If you have a long list of renovations, choose the ones that will make the house functional and that will be more difficult to add later. Another way to get the home you want is to be flexible with where you live. While you want good schools, convenience, and amenities, you may be able to find a good mix of these assets in a neighborhood a few blocks away from your dream location.